I have been asked to give an account of how OVEG started. First let me explain – I am an ‘incomer’ – I was born in London in 1914 and had never heard of Oxhey until my sister Amy Horwood, with her partner Lily Wright, took over the grocer’s shop next to the fish shop in Villiers Road. I used to visit occasionally, and Old Oxhey ‘grew’ on me until eventually I felt that I would like to live here. So, in 1957, I bought my little cottage, in Grover Road (the road of good neighbours). It was quiet and near the fields and had a friendly village atmosphere. I had to travel up to London each day by train to work, along with many others, and it was wonderful to come home to dear old peaceful Oxhey! I realised how blessed we all were to be living in such ideal surroundings. A pleasant urban village, yet near to services and town, with open fields round about us. I began to feel that it would be a good thing if a group could be started that could preserve our way of life and, where possible, protect the village from greedy developers and mad planners. 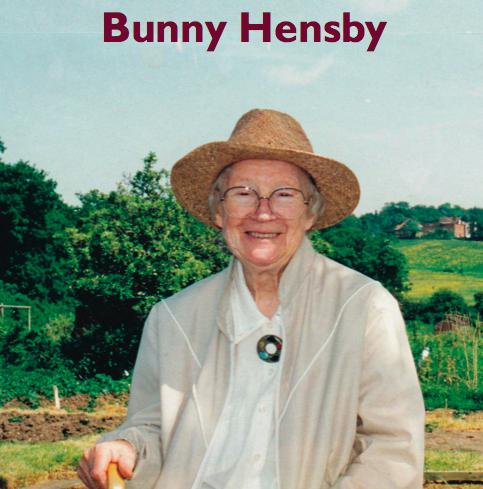 They were the ones who, with me (Bunny Hensby) formed the Old Oxhey Environment Group in 1974. We had posters printed, which were placed round the village and in the Watford Observer, stating our views and asking for support for our first public meeting which we aimed to hold in the New Year. On the invitation we said: “To be successful, any campaign to preserve Old Oxhey must have the support of the people who live here and be free from all party and sectarian interests. The Watford Observer gave us wonderfiil publicity and there was a good response from the people of Old Oxhey, which enabled us to hold our first Public meeting on February 28th 1975 in the Galahad Room at Bushey and Oxhey Methodist Church. About 40 people attended. It was very exciting and lots of FUN! I opened the meeting and explained what we, the sponsors and I, felt about the village and what needed to be done. There was great enthusiasm and it was agreed to form a Group. The name was changed to Oxhey Village Environment Group, which of course, is OVEG. The word old was simply dropped. I then called for the appointment of officers and, as Chairman, I was told to stay put! That’s how I became OVEG’s founder chairman. We then appointed Mrs Susan Boulter as our first Secretary and Mr Geoffrey Greenstreet as Treasurer. There was great excitement and a jolly good evening was had by all. In the early days we were greatly helped by the Watford Observer, who gave us tremendous coverage in all that we tried to do. Their Chief Reporter was Mrs Gwen Dargeville. The Group obtained permission from Watford Council to change the name of Paddock Road playing field to Oxhey Green where we held our first May Fayre which was a great success. It was opened by the Mayor of Watford and the children had lots of fun dancing round the Maypole, which was led by Bushey and Oxhey Methodist Church Brownies, the Bushey Baptist Boys Brigade provided music. The Festivities included a procession round the site, dancers from the Balmoral Highland School of Dancing and the Oxhey Infants School dancers. It was a wonderful afternoon, lots of fun, which is still remembered by many up until this day. By the way, our first subscription was 25p per year! Read Bunny’s obituary on page 11 of December 2011’s OVEG newsletter here. Read a tribute to Bunny in the Watford Observer here.